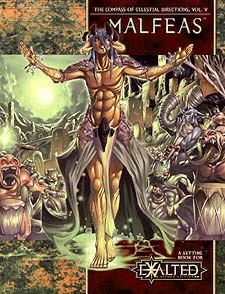 The fifth of five books dedicated to the supernatural locales of the Exalted setting, this supplement focuses on Malfeas, Hell of the Exalted world. Prison to the Yozis and their demon spawn, Malfeas is a twisted place formed from the very flesh of the defeated leader of the Primordials and containing the remainder of his vanquished cohorts. Imprisoned since the dawn of the First Age, these incomprehensible beings have bided their time, waiting for their chance to escape, claim vengeance on the gods and their champions and regain dominion over Creation. And with the birth of the Infernal Exalted and the corruption of the one who leads them, that chance is now. Will Creation's Exalted be able to set aside their differences to end this threat, or will the akuma among them sabotage the Exalt's efforts from within? * Details of several locales of the Demon City, many of which are living aspects of the Yozis themselves. * A myriad of demonic luminaries and demonbeasts for use in any Exalted series. * Everything players and Storytellers need to play series based in the prison of the damned.